Hanging out at Philip Biki’s shop, you can feel the warmth. Whoever walks into his shop will be sure of a kind welcome and an open mind. Whether it’s searching through the floor-to-ceiling shelving to find just the right hat or bag, or talking through life’s ups and downs and putting the world to rights, Phil’s shop is the place. Phil used to have a stall on The Moor and loved it, all ages passing by and lots of chat. 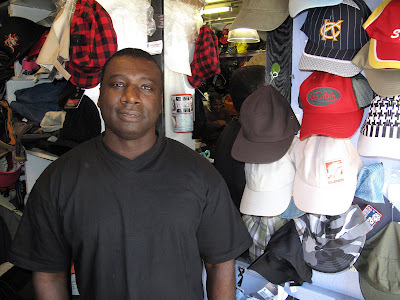 Moving to his shop on Ellesmere Road in 2001, he has seen 10 year-olds grow into adults and bring their own kids in. One such man came in with his two young sons looking for a hat – something “sharp and surprising” – and picked a black pinstripe trilby out of the extensive, eclectic stock. If Phil doesn’t have what a customer needs, he’ll note the request in his diary, then when he’s got it in, will phone the customer to come and collect. Phil’s an experienced international wholesaler and takes regular buying trips to London, New York (where he buys from a big 6,000-outlet wholesale centre) or perhaps Hong Kong, Shenzen, or Guangzhou. J B Hats’n’Things is all about a unique look. Friend and regular customer Val, told us that she (and many others) give Phil a budget to buy things for her, on his international trips. He knows her likes and dislikes and will always come back with items just for her. And they’re hers, there’s no way Phil would sell them, or anything similar, to anyone else. In fact, the shop usually stocks just one of each bag, coat, hat or pair of shoes anyway. Regulars know that if they buy from Phil, they won’t see anyone else walking down the street in the same thing. Customers can also have their hats personalised by Phil’s wife, with beading or feathers, particularly popular for weddings. Customers will go to quite some lengths to buy from Phil. One time we were in the shop, Phil received a phone call from a customer who now lives in Zambia and whose husband was about to visit her. This customer wanted Phil’s wife to pick out a hat for her husband to collect and bring to Zambia. Incidentally, Phil’s wife, having given so much advice and support in the shop over the years, is now studying psychology. You can’t really call a majority of the people in the shop, customers. Of course, they do buy from time to time, especially when the weather changes, but most drop in far more often, sometimes daily, because of friendship, the need to talk or perhaps for some local advice. Val says it’s all about respecting people for who they are and being open. Another friend, who stops by on his way to University, said if the shop were to close, it would leave a huge gap in the neighbourhood.